Suppose you’re living thousands of years ago in China and you wonder whether you have poppy seeds lodged between your teeth or how you look before hitting the town. What are you going to do? “You’d look at your reflection in a mirror, of course,” said Lothar von Falkenhausen, a UCLA professor of art history. Not just any mirror, mind you. You would peer into sumptuous bronze mirrors with reflective surfaces coated in tin and polished with mercury to a high sheen, mirrors with backsides encrusted in mother of pearl, jade and turquoise and richly decorated with animals, plants, human figures, even geological formations rich in mystical associations. Mirrors, in short, that rise to the level of masterpieces. Von Falkenhausen knows this because he has assembled a prodigious amount of research on one of the best collections of ancient Chinese mirrors in private hands. “They’re incredibly splendid pieces,” he said. The research, conducted in collaboration with UCLA’s Cotsen Institute of Archaeology, informs a stunning new exhibit at the Huntington Library. Consisting of some 90 ancient bronze mirrors collected since the 1950s by businessman, philanthropist and UCLA benefactor Lloyd Cotsen, the display runs from Nov. 12 to May 14. 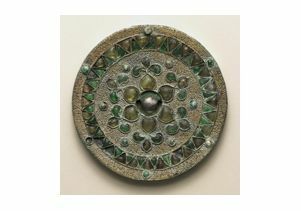 Afterward the pieces, made from an alloy of copper, tin, and lead, will be given to the Shanghai Museum under arrangements facilitated by von Falkenhausen. 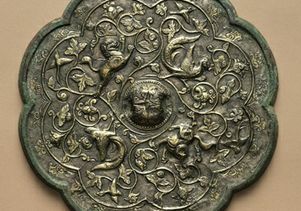 This eight-lobed mirror with vines, birds and mythical animals, cast in bronze with silver amalgamm is in the Cotsen Collection. Photos by Bruce M. White. It’s all in a day’s work for the scholar who was among the first generation of Westerners to establish a toehold in China’s archaeological community after the Cultural Revolution. 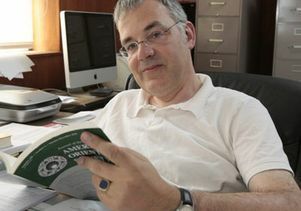 In a career marked by exciting archaeological discoveries and landmark publications, the 19-year UCLA veteran has distinguished himself as one of the world’s top authorities in ancient China and a passionate advocate for the ethical dispensation of the country’s cultural patrimony. “He’s truly amazing scholar and an amazing person,” said colleague Hui-shu Lee, a UCLA associate professor in Chinese Art. Yet, by von Falkenhausen’s account, his entry in the field was an accident. The year was 1979 and the German native was a Chinese major at Bonn University. Having been fascinated by the language since junior high school, he leapt at an opportunity to participate in a two-year exchange program with China. Sent to Peking University and pressed to pick a single area to study, he selected archaeology, but less out of curiosity in the field than in the country. 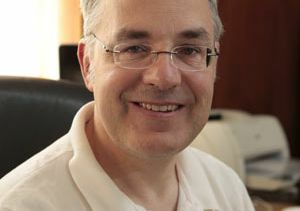 “I imagined the course of study would offer the perfect excuse to go traveling everywhere in China,” von Falkenhausen recently recalled. 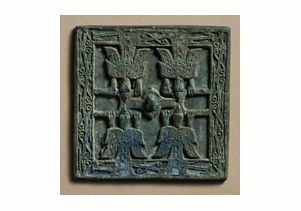 Square mirror with five mountains, birds and plants, in cast bronze. 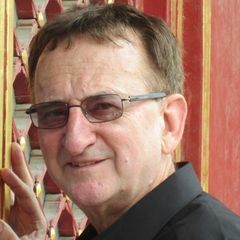 Having played violin and piano as a child, he devoted his dissertation as a graduate student at Harvard to the musical instruments of China’s Bronze Age, an experience that inspired him to write the 1993 book “Suspended Music: Chime-Bells in the Culture of Bronze Age China” (University of California Press). Synthesizing a wide array of archaeological discoveries from between 1700 and 221 B.C., the book recounts how the country came to produce the world’s first bronze chime-bells, each capable of producing two tones, depending on where they were struck. “These amazing instruments were one of the great inventions of Chinese civilization, and they served as a trigger for the development of all kinds of scientific thinking in China because the greatest intellectual energies were expended on their manufacture,” von Falkenhausen said. Even after all these years the book remains the definitive treatment of the subject. Mirror with riders and figures in landscape, in cast bronze with lacquer and painted mineral pigments. Von Falkenhausen also has distinguished himself in field work. Among the first wave of Western archaeologists to participate in excavations in China, he co-directed the nation’s first exploration of a prehistoric salt production site. The project, which ran from 1999 to 2004, proved that salt production occurred 1,200 years earlier in China and 1,800 years earlier at the specific site than previously thought. Until the Huntington exhibit, however, the archaeologist’s contributions have been appreciated primarily by the scholarly community. “Ancient Chinese Bronze Mirrors from the Lloyd Cotsen Collection,” for which von Falkenhausen edited the exquisite two-volume catalog, is expected to bring his expertise to the attention of a wider audience. 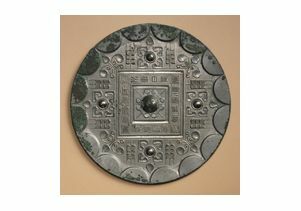 The mirrors did roughly the same thing for China’s Bronze Age technology. Square double-tier mirror with four opposed birds. Usually cast from clay molds, they were highly polished on one side, offering a reflective surface, while the other side was decorated with intricate patterns and designs that reveal an astonishing level of skill and artistry in their craftsmanship. Some are compact and portable enough to be held in one hand, and others are large and heavy enough to require stands. Birds, dragons, and serpents were common motifs in the earliest mirrors. Later, more sophisticated and intricate designs included mythological figures, deities, animals of the Chinese zodiac, abstract patterns, background textures, and inlays of jade, turquoise, and mother-of-pearl. Ranging in date from the prehistoric Qijia Culture (2100–1700 B.C. ), the Warring States period (450-221B.C. ), and the Han (206 B.C.-220 A.D), Tang (618–906 A.D.), Liao (907-1125 A.D.) and Jin (1115-1234 A.D.) dynasties, the pieces reflect the broad sweep of Chinese history. In their variations, von Falkenhausen can discern changes in taste, the spread of religious and cosmological ideas about humans’ place in the world, and the influence of expanding commerce over long periods marked by violent wars and frequent changes of dynasties. As the Silk Road opened up trade routes to and from India, Persia, and Egypt, for example, new aesthetic elements borrowed from the West began to appear in Chinese design. Twisting grapevines, floral motifs and intricate silver fretwork overlaid on bronze added exotic allure to these symbols of wealth and status. Two-part mirror with floral pattern, in cast bronze with gilt copper granulation and inlaid glass, turquoise, and pearl. Cotsen’s collection includes a specimen that dates to between 1800 and 1700 B.C., which is as old as any mirror ever discovered in China. 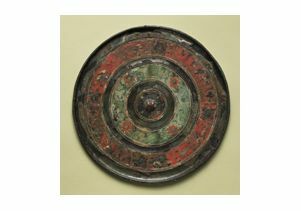 It includes one of the earliest examples of lacquerwork preserved in near pristine condition: a square mirror from between 450 and 221 BC that is decorated with four raised serpents covered in black and red lacquer. Research conducted at the Cotsen revealed an interesting detail about a mirror from the same time period: decorative silk used to peak through the scrolling pierced design on the mirror’s backside. Von Falkenhausen is particularly fond of a specimen that dates to 420 to 618 A.D. and is studded with glass pieces that may have originated from as far away as the Byzantine empire. “It’s one of the most significant bronze mirror collections ever assembled anywhere,” he said. 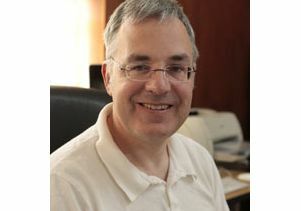 Von Falkenhausen will discuss the “The Introduction and Transformation of Mirrors in China” at 7:30 p.m. Tuesday, Feb. 7 in the Huntington Library’s Friends' Hall.